About Nittan Europe Limited - Products, News and Contacts. 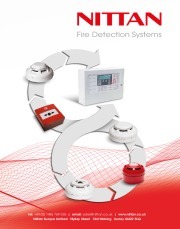 Nittan Europe are exhibiting a comprehensive range of conventional and analogue addressable fire safety products at this year’s FIREX International, including Nittan’s premium Evolution range of detectors featuring patented, award winning Dual Optical technology plus a number of new Evolution products which will be revealed at the show. The products will be exhibited in a refreshing and approachable way to allow visitors to interact directly with them to see the quality build. Evolution Addressable and Conventional detectors combine truly exceptional and reliable fire detection with a very high degree of protection against unwanted false alarms. Also on display will be Nittan's interactive touch screen evolution1 single loop fire alarm panel with intuitive menu structure, and the evo+ multi-loop EN54 Fire Alarm panel for larger systems, plus Nittans SPERA UL approved system for export markets.